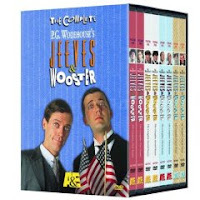 This wonderful British comedic series follows the escapades of the wealthy Bertie Wooster and his loyal manservant Jeeves who gets Bertie and his upper class friends out of all kinds of pickles, be they romantic or otherwise, by using his sharp intellect. Watching these films has got me thinking about the fashions of the upper-crust English gentleman and all the various accoutrements that go into looking like a member of the old London aristocracy. 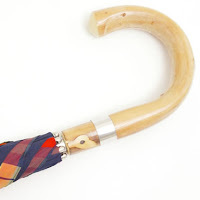 The necessities for emulating a dapper member of the old fashioned gentry but still looking hip enough to walk the streets of Chelsea in 2008 include a pair of round tortoise shell spectacles, brightly colored pocket squares, and a proper man's tartan umbrella for April showers. My father has perfected this look by donning tweed suits and newsboy caps, but for those of you who don't want to go all the way, employing one or more of the suggestions above is a good way to dip into this timeless trend. OMG you're dad totally rocks the spectacles! No contest.